The Parker-Hale "Optical Sight Set"
This optical sighting system was designed by Parker-Hale for fitment to practically any sporting rifle of the day. Advertised from the early 1920s until shortly before the Second World War, it provided an economical means to improve the sighting of small game with rimfire small-bore rifles. The 2X magnification objective lens could be clamped to the front of the barrel of any rifle that had no other obstructing foresight in place. A rear-sight clearing or correcting lens could be fitted in place of most of the contemporary rear aperture eyepieces. At a time when an imported basic Winchester telescopic sight cost about £8 with its mounts, the "Universal" set cost little more than £1 with your chosen lens type. The system was effectively a then latter-day evolution of the early "Lattey" design of Galilean sight that provided First World War snipers with an improved sight-picture over their Short Magazine Lee-Enfield (S.M.L.E.) rifles. 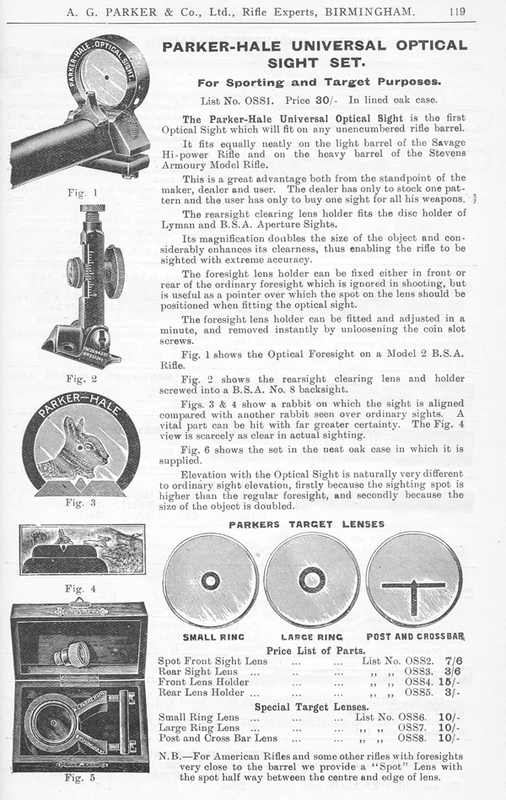 The 1925 A.G. Parker advertisement for the Universal Optical Sight Set is shown below. 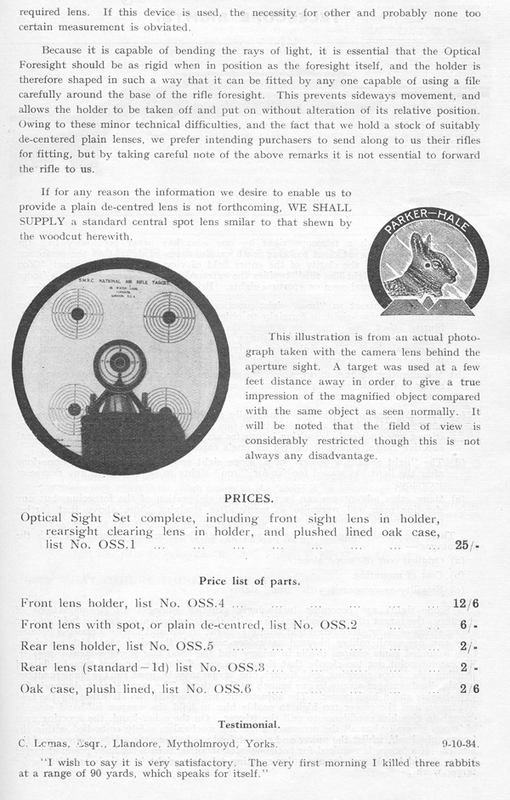 As can be seen, the sight system also accommodated target shooters, but one needs to be reminded that such an optical sight set-up would not have been eligible for most target shooting at that time. The only competitions in which it could have been employed would have placed it in competition with such as the aforementioned Winchester, or the similar contemporary the Stephens No 368 telescopic sight, each respectively with 5 and 6 times magnification, leaving the Parker-Hale "Universal" sights completely outclassed. Parker-Hale had also, in 1933, introduced their own telescopic sight, the P-H "Targetscope", modelled on the American Fecker product. Marketed both by A.G. Parker and Parker-Hale, the Universal Optics were realistically only for use in the field.
' We cannot point out too clearly that an Optical Sight cannot be "stuck on", it must not be capable of sideways movement, and must therefore be "fitted". The lens must be just right, and must therefore be "selected". If you want a satisfactory job we must rely on your co-operation after carefully reading these remarks, unless you prefer to send us your rifle. This was an effective admission, apparently not mentioned prior to 1935, that the sights could not easily be added to the rifle and removed on a frequent or "as needed" basis. In fact they were both less versatile and effective than a properly mounted 'scope, which could be removed and re-fitted at will without altering the rifle's zero. Additionally, the choice of lens was critical. 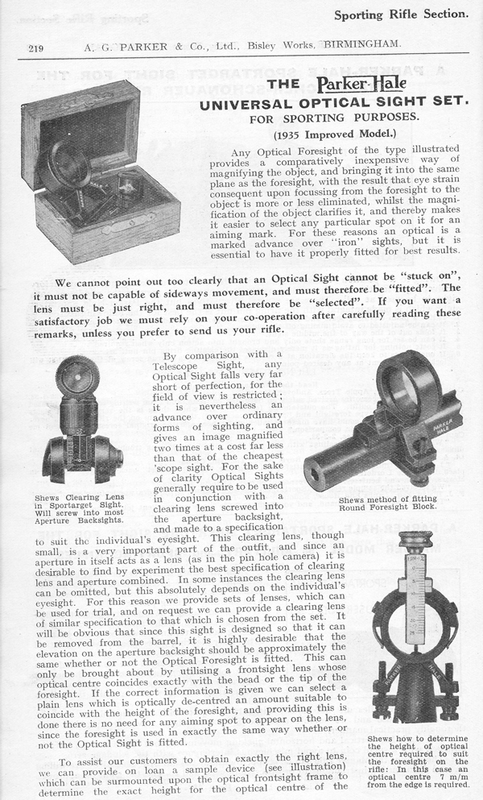 The Universal Optical system, at first glance, appeared to offer a cheap and practical alternative to a telescopic sight, but the truth was somewhat different; leading to most of them languishing unused and undiscovered for many years in their dust-covered boxes.